Hurry, 12% off at Marriott hotels!!!! I know, 4 exclamation marks. But this is truly rare. We all know to check cashbackmonitor.com for the best portal to book anything through, including stays at Marriott. Usually, I can get 1 or 2 miles per dollar at American Airlines, but nothing crazy. If lucky, it times well with a shopping portal promotion for bonus miles after X spend that one stay covers. But THIS is pretty amazing. 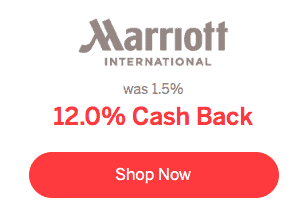 Right now, and probably not for very long (maybe through today, maybe demand will kill this early), yu can get a crazy 12% cash back on Marriott bookings via Ebates. If you have any cancelable bookings, book a second room using Ebates and then cancel the first one. Be sure to do in this order just in case your existing rate is no longer available or something else goes wrong before confirmation. The exclusions are not clear about former SPG brands. They *should* be included if not excluded as they are now simply a part of Marriott. But it’s a possible grey area. We have never seen a rebate this size. I’m about to do this myself on a few bookings right now…. I just wanted to let you all know right away! 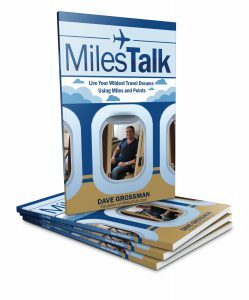 Let me know if you book this – on Twitter, or in the private MilesTalk Facebook group. Does booking through – like booking through United or American count as direct booking with Marriott? You would have to pick one or the other. If you click through from AA or United portals you’ll earn miles. If you go through Ebates you’ll earn cash. You can’t do both.